Do the birds in your yard have to wait their turn to get to the feeder? Adding more feeding stations reduces this competition. Providing mixes designed for specific birds in appropriate feeders will increase the number and species of birds for you to enjoy. Who Will Show Up at the Feeder? Among the birds visiting your yard are a select group of smaller birds with bills that seem tiny for seed-eaters. They include American Goldfinch, Purple Finch, House Finch, Pine Siskin and Common Redpoll. Rarely a Hoary Redpoll may be seen. What’s the Best Feeder To Use? These species comfortably perch on tube-style feeders. Other larger birds have trouble with the short perch lengths. 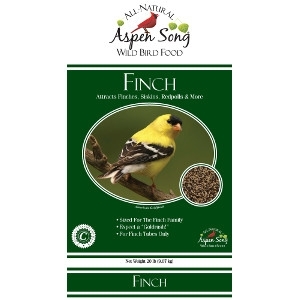 Offering this mix in a tube-style feeder with tiny seed ports designed for Nyjer® seed, means the small-billed, perching birds will have a dinner table set just for them.